Stay in a luxury hotel in one of the UK's most popular destinations from as low as £50 per person. Where do I use my Superbreak voucher code? You can then complete your purchase securely with your savings applied. With over 30 years of knowledge and experience behind their belt, Superbreak are proud experts in providing perfectly crafted short breaks! As an award winning company, you know you’re in the best hands when it comes to planning your next trip. From Hotels Breaks in the UK to Concerts abroad, theatre breaks, rail experiences and much more, your next unforgettable break is awaiting you right now at Superbreak. Explore the abundance of categories available at Superbeak and you’re guaranteed to find a break perfect for you. Whatever your preference and budget, Superbreak have got it all! Browse top UK hotels in London, Edinburgh and Manchester or head further afield to Amsterdam, Budapest and other European Hotspots. Catch productions and shows across the globe, see your favourite artist live abroad or laugh it up at a comedy show in a bustling city. With Superbreak, you could even hit the road and travel by rail or the Eurostar to discover places unknown. Whatever your taste, fuel your taste for travel with Superbreak and know after an eventful day you have somewhere great to rest your head. With Superbreak, you are guaranteed to find the perfect City Break, whatever your preference. With the wide range of flight and hotel packages available, you can enjoy a break to remember in one of Europe’s most riveting cities! Choose from luxury resorts in some of the world’s landmarks, to more budget style accommodation. Whatever your needs, your are sure to find something you will love without breaking the bank. Top destinations such as Paris, Edinburgh, York, Dublin, Rome & Venice are amongst a whole host of cities to choose from with Superbreak. Including added extras and sightseeing opportunities, you can ensure value for money and make the most of your city break experience. Superbreak knows that choosing the right hotel and location can have a big impact on your trip away. 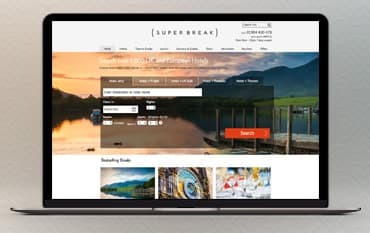 With over 7000 different hotels in over 1000 different destinations worldwide, Superbreak is the best place to start your search for the ideal hotel for your break as their is plenty of choice! Find hotels in top UK Cities like Bournemouth, Brighton, Edinburgh, Manchester, London and York and explore the history, culture and fantastic amenities and activities available. Browse hotels in overseas cities such as New York, Amsterdam, Paris and Rome. From midweek and weekend breaks to spa breaks, golf breaks and many more, Superbreak have got it all. Can rail tickets be booked on their own? unfortunately it is not possible to book rail tickets separately. Superbreaks specialise in short break packages, which means that the rail travel must be booked with a hotel stay to take advantage of the cheaper rates. I have seen an offer on your TV advert how do I find it on the site? Any offers that are featured on the TV adverts, visit the TV info page and you will find the offers listed on here. Am I able to book a package for a group? Yes, there is a dedicated group booking team to assist you with any group bookings, whatever the occasion. Simply fill in the group enquiry form or call the groups team on 01904 420 451 (lines are open 8:30am to 6:30pm Mon - Fri & 9:00am to 5:00pm Sat). If you’re seeking an unrivalled selection of Breaks and getaways both in the UK and overseas, look no further than Superbreak. Boasting perfect packages including Hotel & Theatre Breaks, UK Weekend Breaks, Theme Park Holidays and so much more - Your next Superbreak trip is guaranteed to be one you’re unlikely to forget. What’s more, using one of our Superbreak Voucher Codes can secure you money off your booking at the checkout making your next trip that extra bit special. From idyllic getawas in North Iceland to days out at Chester Zoo - Superbreak is sure to wow you with their extensive offers perfect for the whole family. We are constantly on the hunt for Voucher Codes for Superbreak to help you with your money saving. Our experts check dozens of sites for secret codes including NHS discounts, student sites & social media channels saving you time & money!